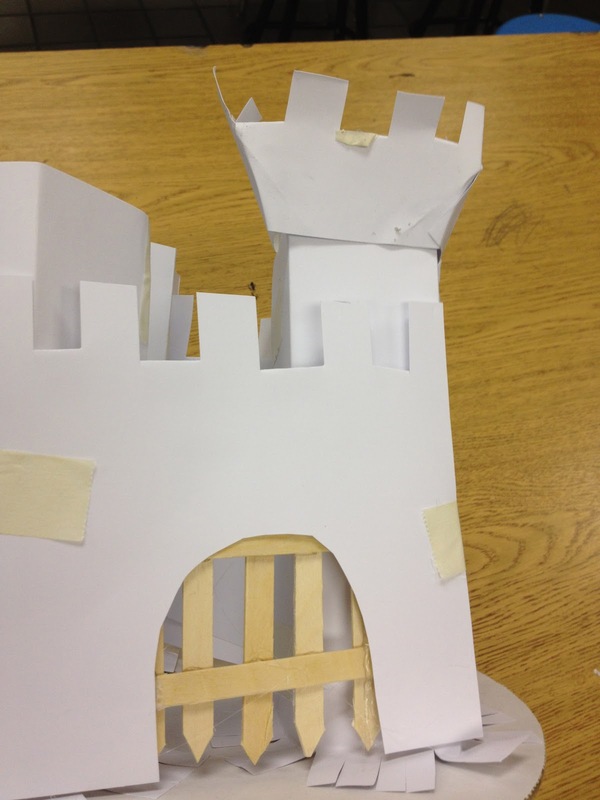 After watching the video of David Macaulay's Castle, my students designed their own fortresses. They tested the defensive walls by building catapults with popsicle sticks, rubber bands and spoons and firing mini marshmallows at their creations to see how many could land inside. Caerphilly Castle was built in the thirteenth century. It is the largest castle in Wales. 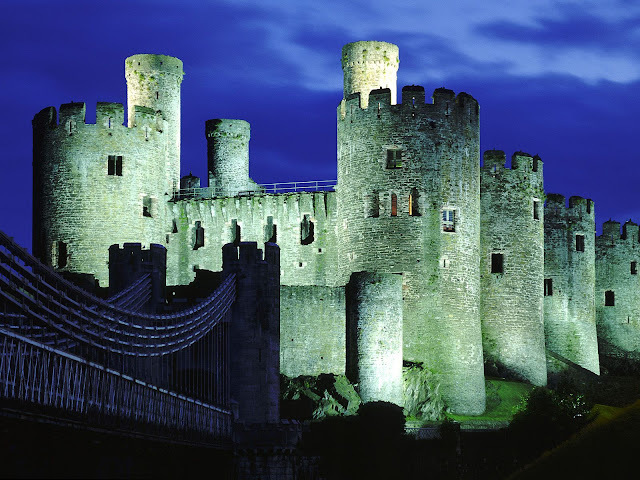 To learn more about Caerphilly Castle, click here. David Macaulay re-creates the building of a medieval Castle in his book Castle. For more information about this very detailed and informative book, visit the author's website by clicking here. To watch a four part movie based on the book, click on the YouTube videos below. 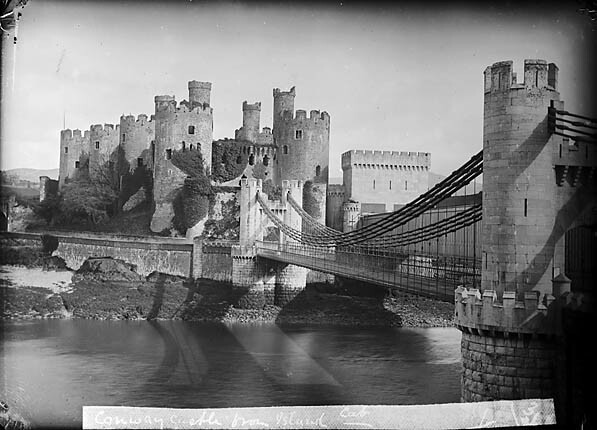 The castle in Macaulay's book is imaginary but it is based on several real Medieval castles. MEDIEVAL CASTLES LOOK SO DIFFERENT FROM EACH OTHER? HOW ARE THEY ALL ALIKE? 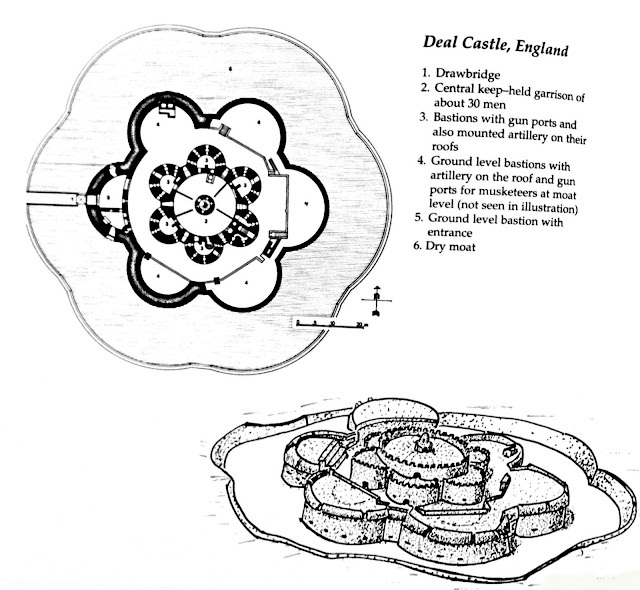 There was no standard shape and structure for a castle. The builders adapted their designs to suit the site, the budget and the military dangers of the day. Print out the picture above and look at all the basic parts that make up the anatomy of a Medieval castle. The castles all look very different from each other, yet they are all made up of the same basic components. 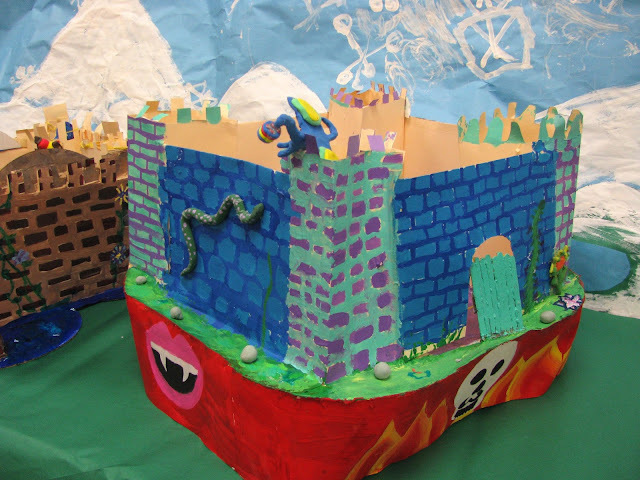 See if you can identify the components all of these castles have in common. How would geographic location and the topography of the site influence a castle's design? 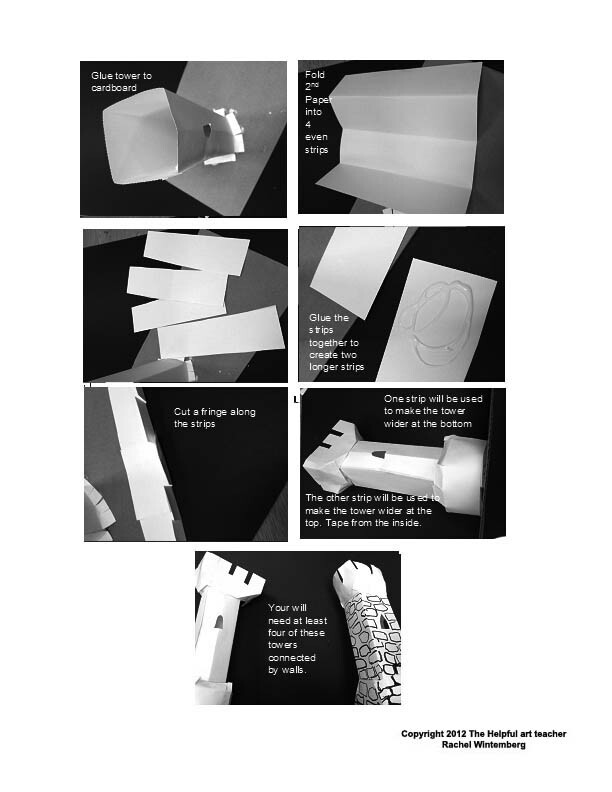 Click here for a step by step Power Point presentation by The Helpful Art Teacher on how to design and build your own paper castle. scissors,markers, paint and whatever else you wish to use to decorate your creation. 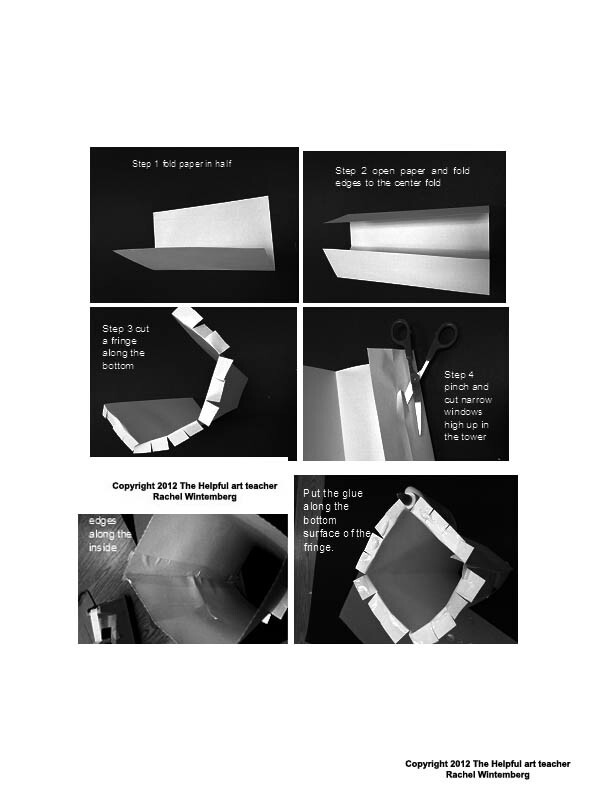 A small inexpensive low temperature hot glue gun is useful but not necessary. You will need to build at least four of these towers and connect them by walls just to start building your castle. These worksheets are just to get you started. Be inventive! 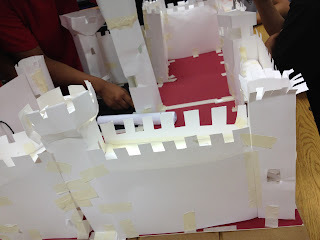 Figure out how to include all the parts of the castle from the moat and draw bridge to the gate house and portcullis to the inner ward and keep. Work in progress: These 7th grade students are creating a curtain wall, the wall surrounding their castle complex. A soldier can walk along this wall and shoot arrows at his enemies from behind the embrasures. 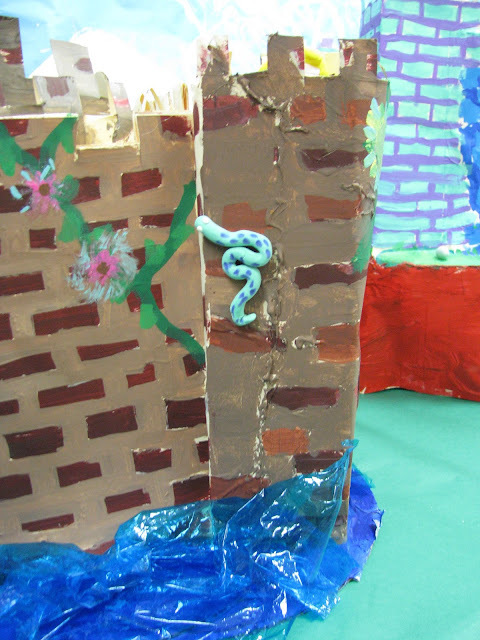 Interior and exterior shots of one 7th grade student's work in progress. She used a sharp scissors to cut the points on the Popsicle sticks that form the portcullis. 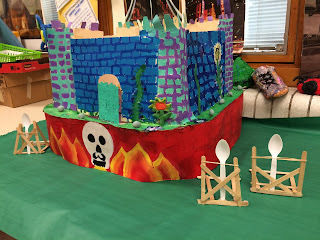 When each group was done constructing their castles I gave them 12 Popsicle sticks, a rubber band, a plastic spoon and permission to go over to the hot glue gun table. Their mission? To design a working catapult capable of lobbing mini marshmallows into another group's castle. 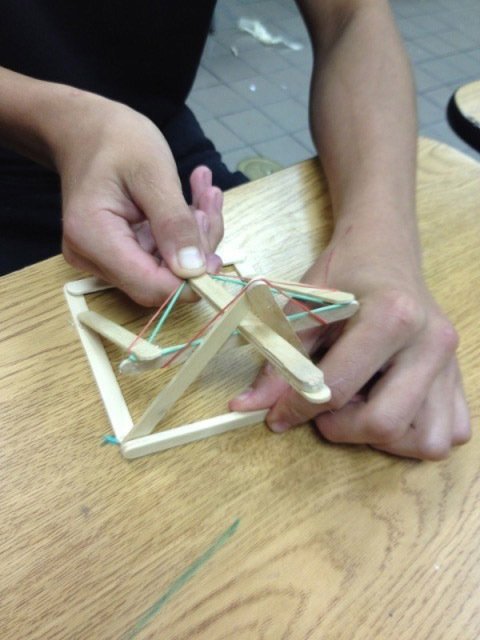 Click here to learn how to build a miniature working catapult out of Popsicle sticks (so you can storm your paper castle). 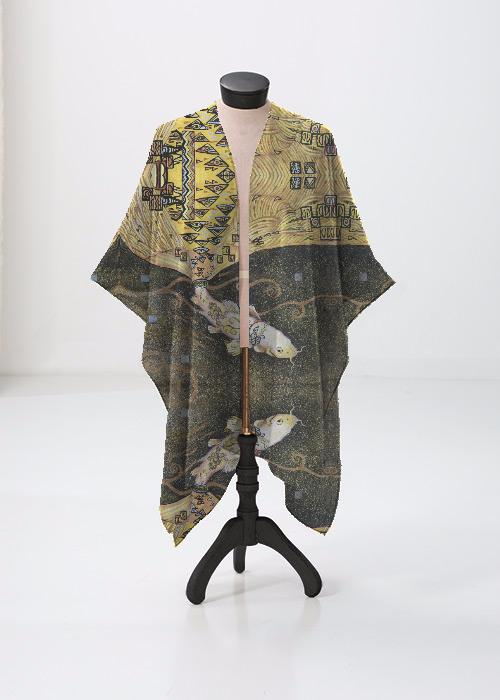 This website gives step by step directions but I prefer to have my students come up with their own designs. 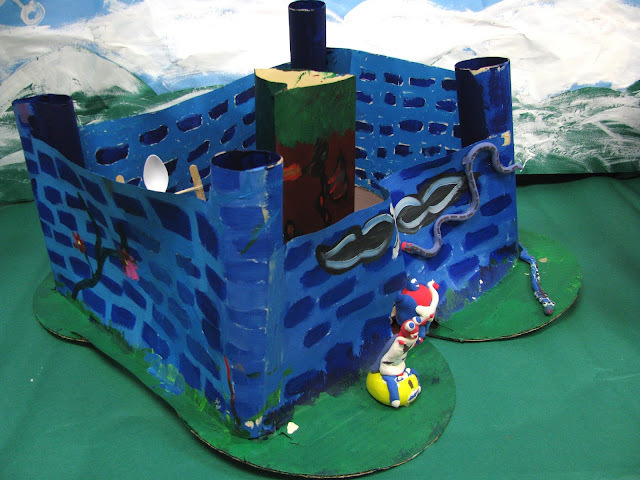 As you can see, from the video below, my 7th graders' original contraptions worked quite well. 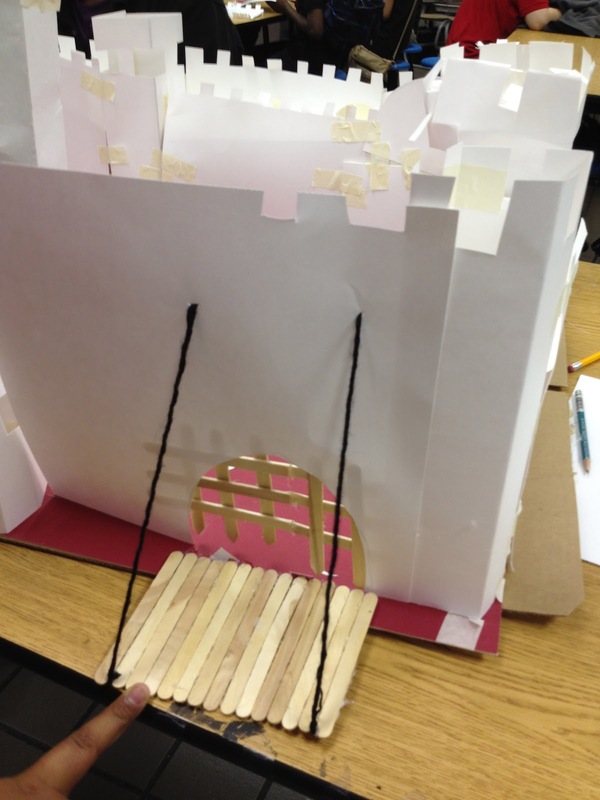 catapult design by a 7th grade student from Rachel Wintemberg on Vimeo. 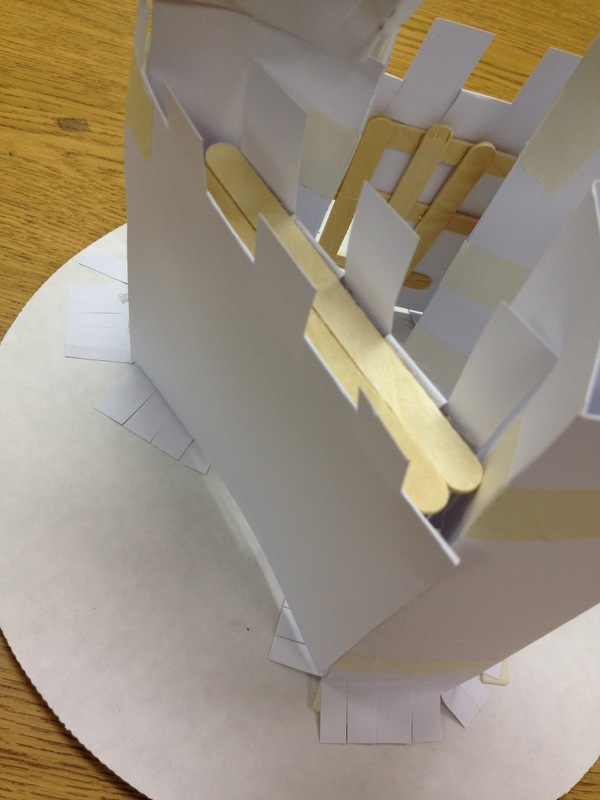 STEAM connection: How does building a catapult connect art to science, technology, engineering and math? 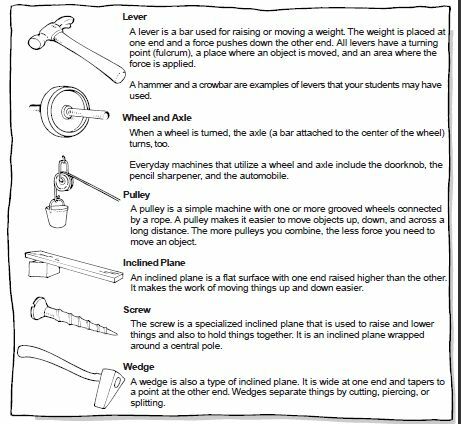 When you create a catapult you are using a simple macine, the lever. If you pull the spoon back, the taut rubber band has potential energy. When you let go of the spoon the marshmallow is propelled by force and has kinetic energy. When you pull the rubber band back to a 45 degree angle, the marshmallow will travel the farthest distance. When you pull it back farther, the marshmallow will travel higher, but not go as far. We set up our catapults behind a taped barrier and asked the students to see how many mini marshmallows they could get into each castle. 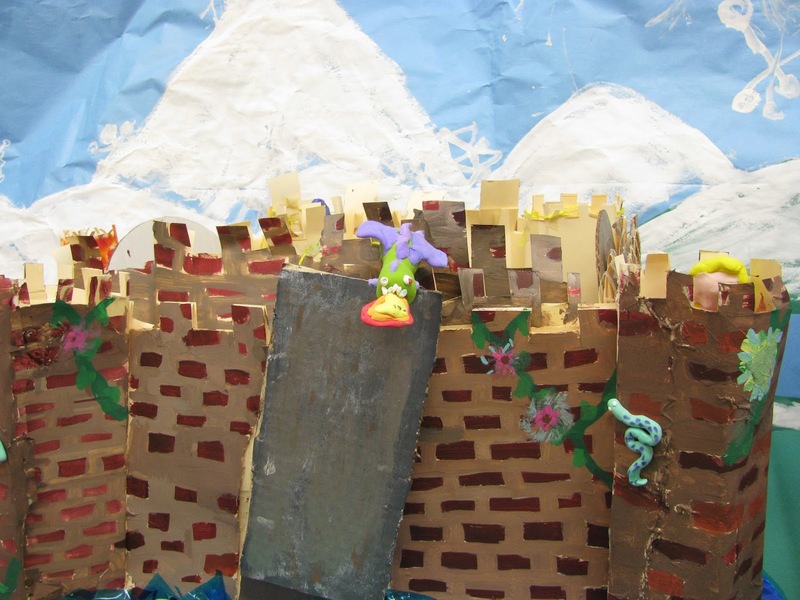 In order to make it over the wall, student found that they ideally needed to pull the spoon back farther than 45 degrees to attain more height and less distance. We discussed how the goal of the job affects the method used to launch the catapult; had the goal been to make the marshmallow go the farthest distance, then a 45 degree angle would have been preferable. 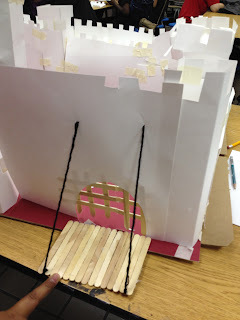 The portcullis and draw bridge on the castles above operate using a pulley, another simple machine. Show students simple machines and have them divide into small groups to brainstorm how they might incorporate simple machines into their castle designs. For instance, a pulley might be used to draw water from a well as well as to control the draw bridge and portcullis. This student took the assignment a step farther. 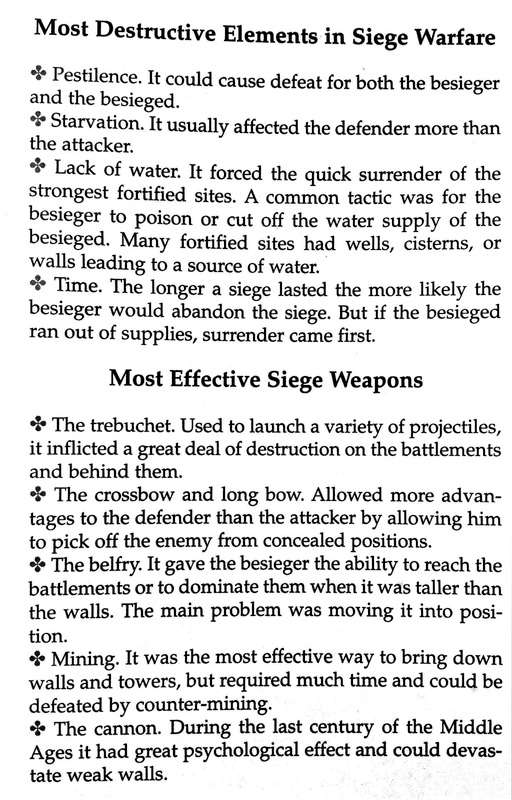 After researching medieval weapons he decided to design a crossbow to defend his fortress and siege neighboring castles. He was, of course, very careful to aim his weapon at rival social studies projects and never at people. 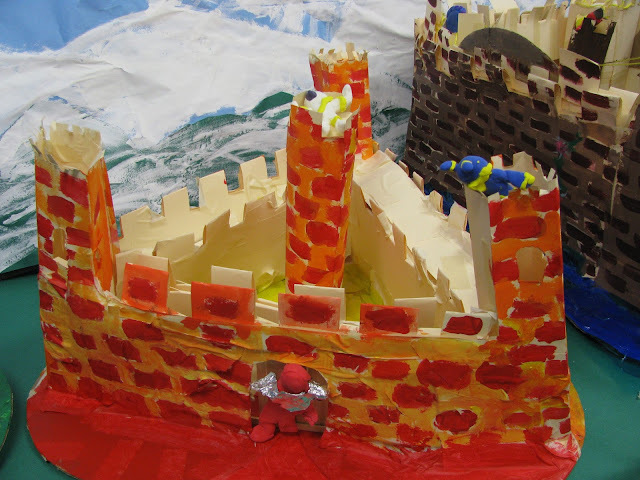 Learn all the parts of a real medieval castle and what they were used for before you begin. 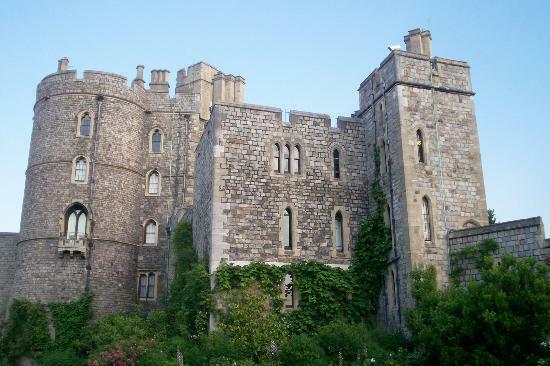 Look at several real castles and their floor plans before you create your own. 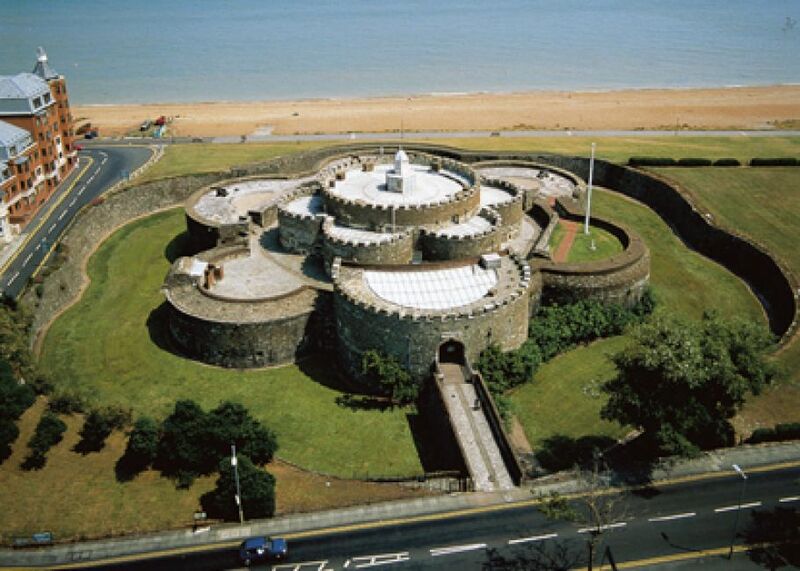 Remember, fortresses were designed and built for defense so make sure your castle will protect the inhabitants within. You will remember the vocabulary better if, after reading the definition, you click on the word. This will bring you to a picture that illustrates the word. 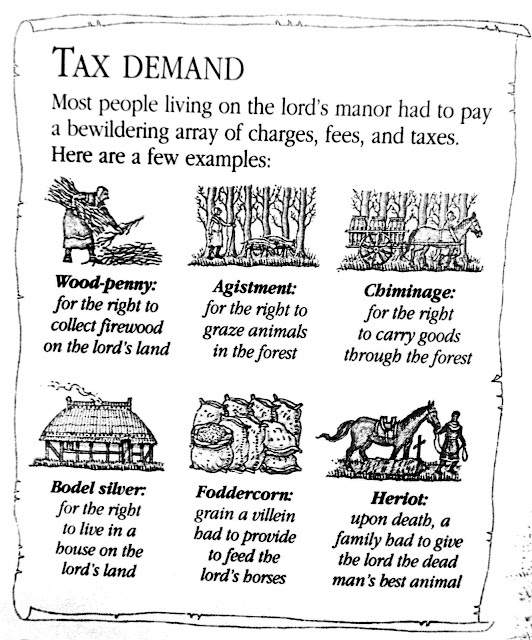 If you are building a castle for a 7th grade social studies class your teacher will probably expect you to use these vocabulary words to label the parts of your castle. You will also be expected to demonstrate the ways in which your fortress uses these elements to protect it's inhabitants. 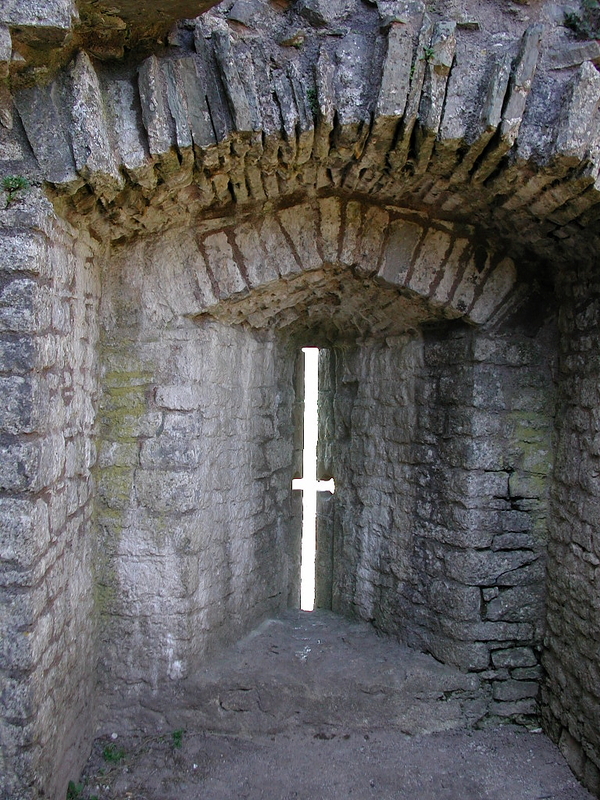 Arrow Loops - These were slots in the walls and structures that were used to shoot arrows through. They came in a wide variety of shapes and sizes. Ashlar - Blocks of smooth square stone. They can be of any kind of stone. 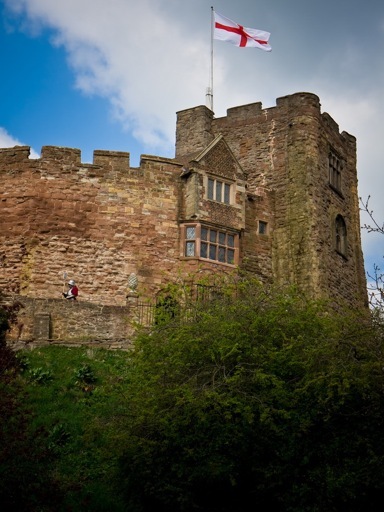 Bailey: This is a courtyard or open space surrounded by walls.The walls that make up the Bailey are also considered to be part of the Bailey. A castle could have several. 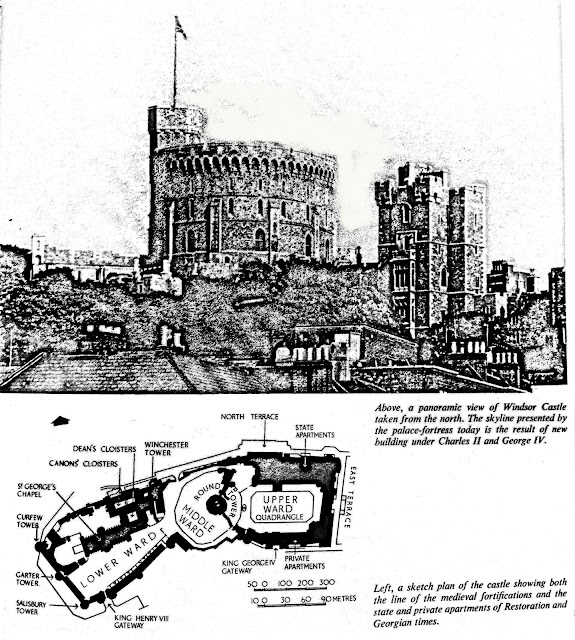 Sometimes they were called the upper bailey and lower bailey or the west bailey and east bailey. Barbican: A stone structure that protected the gate of a castle. Think of it as a gatehouse. It usually had a small tower on each side of the gate where guards could stand watch. Bartizan: A small turret at the corner of a tower or wall. It is usually at the top but not always. 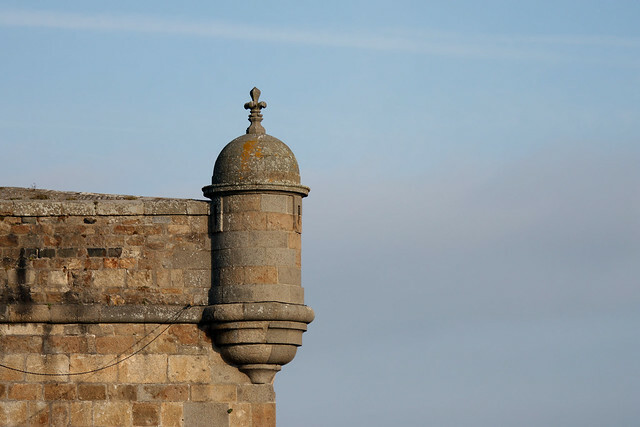 Battlements: These are the structures at the tops of the walls surrounding a castle. Picture what you have seen in the movies where archers are at the top of the wall and firing arrows between open slots down on the attackers. These shapes at the top (Where the archers position themselves for battle) are called battlements. 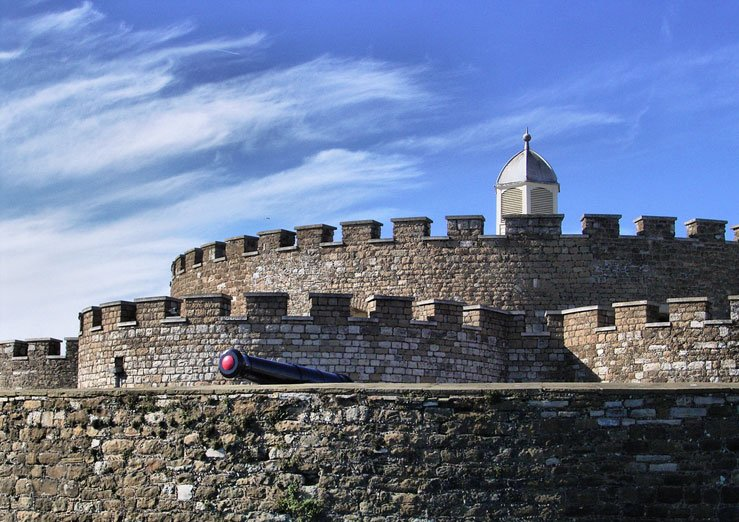 They are also referred to as crenellations. Buttress: A masonry projection used as additional support for walls. Notre Dame Cathedral is a good examlple of the use of Buttresses. Corbel - A stone projection from a wall. It supports the weight of a battlement. Courtyard - The open area with the curtain walls of a castle. Curtain Wall - The stone walls around a castle. Drawbridge - This was a wooden bridge in front of the main gate of the castle. In the early centuries of castles it was moved horizontal to the ground and in the later centuries it was built so it could raise up in a hinged fashion. Dungeon - A deep dark cell typically underground and underneath a castle. This is a derivative of the word Dunjon. Donjon - this is an old word for a great tower or a keep. Embrasure - An opening in a parapet wall. 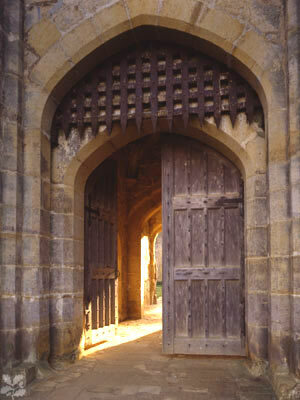 GateHouse - A strongly built and fortified main entrance to a castle. 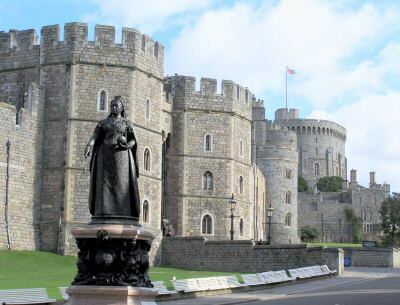 It often has a guard house and or living quarters. Hall or GreatHall - This is the major building inside th walls of a castle. Hoarding: a covered wooden gallery above a tower the floor had slats or slots to allow defenders to drop object on besiegers. They could also drop liquids and projectiles. Keep - This definition changed slightly over the centuries of castle building. In the early years of stone castle building the Keep was a standalone structure that could be defended and often square in shape. Over the centuries these structures were improved upon and built around. Thus a castle was made that was a larger and more complex structure. The main tower that this was built around was still called the Keep and it was usually the tallest and strongest structure in the castle. It was also used as the last line of defense during siege or attack. 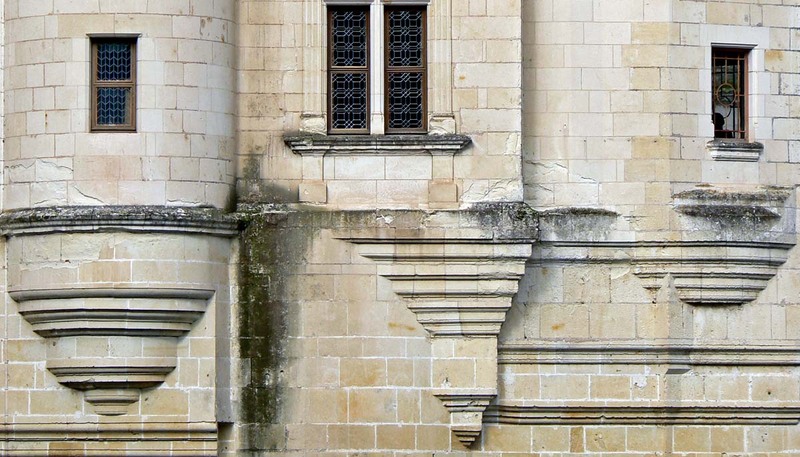 Machicolations - The openings between the corbels of a parapet. 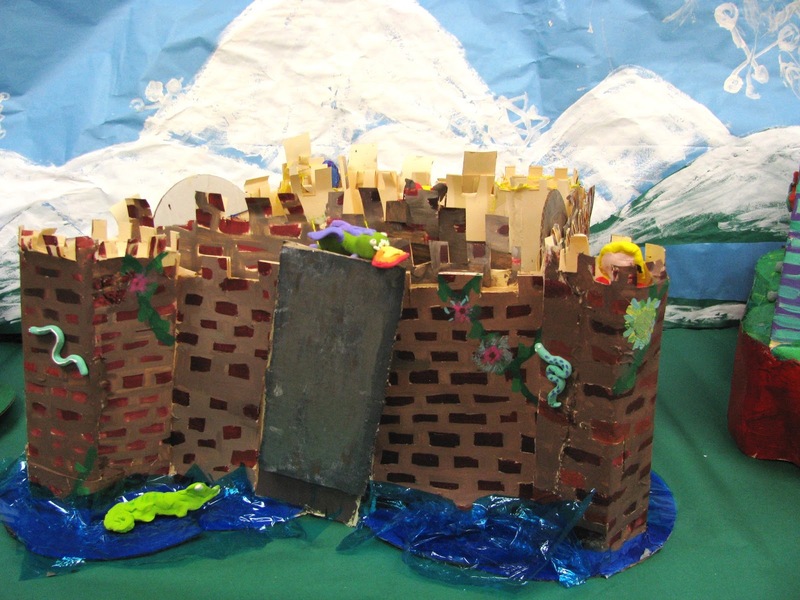 They form areas that stick out along the top of the wall and defenders inside the castle can drop items like boiling water and rocks onto attackers. 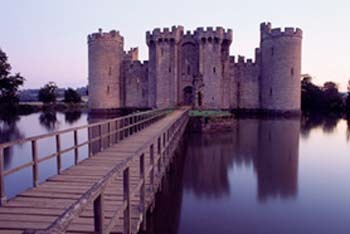 Moat: A Body of water surrounding the outer wall of a castle. It was often around 5 to 15 feet deep and it was sometimes within the outer wall -between the outer wall and the inner wall. 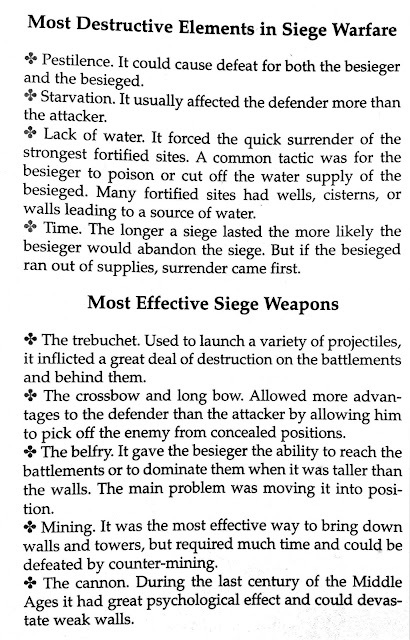 The primary purpose of the moat wasn't to stop attackers it was to stop tunnelers. 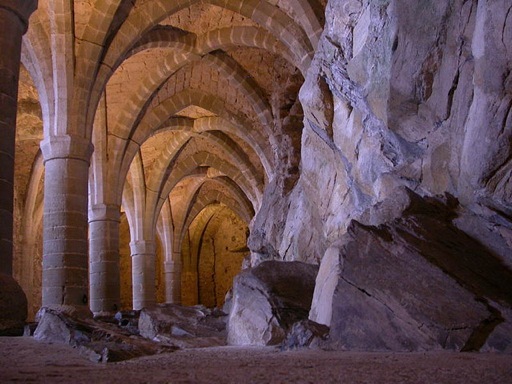 Tunneling under a castle was an effective means of collapsing the walls or infiltrating it. A moat would cause any tunnel to collapse. Motte And Bailey: This isn't part of a castle it is the predecessor to the castle. A Motte and Bailey was an early form of castle where a large mound of dirt was built up then a wooden fortification was placed on top. This wooden fortification was in the shape of a timber fence that formed a circle like a crown at the top of the mound. The Mound is the motte, and the timber fence and the space it enclosed is the Bailey. Murder Hole: An opening in the roof of a gateway over an entrance. Used to drop projectiles or other things onto the besiegers. Oubliette: A deep pit reached by a trap door at the top. Prisoners were kept in it. Portcullis - This is a metal or wood grate that was dropped vertically just inside the main gate to the castle. 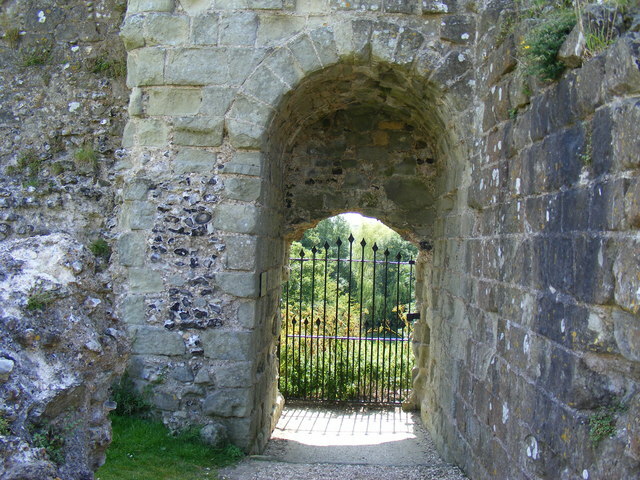 Postern - A small gate at the back of a castle. Often considered to be a "Back Door". Rampart: Picture the battlements in the previous definition. 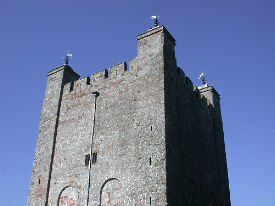 The battlements are the top sections of the outer wall of the castle. Now to access these battlements the archers would stand on a walk way that was a wall in it's own right. This walkway is built right up against the outer wall and is called the Rampart. 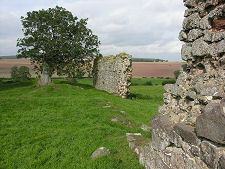 Ward - The area inside the walls of a castle. Often also called the Courtyard. Derrick C. Kyriacou and the Social Studies department at William C. McGinnis School. Please note: The pictures of actual medieval castles come from Wikimedia commons and are in the public domain. A few of the black and white images are handouts I have had for many years. If anyone knows who I should attribute them to, please email me. The pictures of step by step directions and photographs of student art work are my own. They may be downloaded and reproduced for educational purposes only (with appropriate credit given) in accordance with fair use law. Please do not republish them without contacting me for permission. Wow! I'm working on a castle project for my 4th grade Art students....so glad I stumbled upon your site! I especially like the vocabulary and hand-outs! Good site. Great pictures. Well done. Thanks for such an awesome resource! 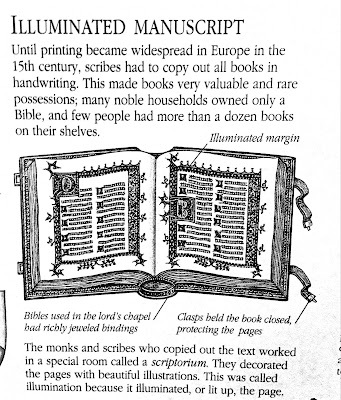 Perfect for my fifth grade research.